Carlton Lakes Homes: H.13583 - Spectacular Coastal Contemporary! Custom floorplan beautifully updated! Split bedroom floorplan with both formal and casual living and dining areas. Lovely lakefront/preserve setting with relaxing water feature. Kitchen fully renovated in 2017 including granite with leather finish, appliances, and fixtures. Gracious over-sized master suite offering walk in closet with custom shelving, bath with dual sinks, granite counters, towel warmer and lots of light. Whole house upgraded with sound system, granite counters throughout including laundry room, all tile floors on diagonal, crown molding and pavered driveway to double garage. Saltwater pool system, spacious lanai with pavered deck and upgraded screen enclosure. Excellent gated community in North Naples with clubhouse, fitness center, pool and play ground. New A/C and water heater in 2015. Carlton Lakes Homes: Perfect for an investor or someone who does not need to occupy home immediately. The sale of this property is subject to a lease through September of 2019. Located on a Cul-de-Sac Street in the Livingston Rd corridor, Corner of Immokalee Rd and Livingston Rd is this custom built home in excellent condition. 3 Bedroom, 2 bath 2248 sq. ft. Lakefront pool home in the gated community of Carlton Lakes. Decorative features include paver driveway, Shutters system on whole home, Double leaded glass entry doors, large pool with water display, large tile on the diagonal everywhere, crown molding, 8 ft. doorways, upgraded cabinets in kitchen, Corian Countertops with double bullnose, Newer A/C, Pool Heater and Water Heater. Carlton Lakes is an amenity rich Community with Two Clay Tennis courts, Two Bocce-ball Courts, Active Clubhouse with Pool/Spa, Exercise Room and Library, a Basketball Court and Sidewalks throughout neighborhood. Close to Delnor Wiggins State Park, Mercato, Hospital and North Naples Shopping. Great school district! Low HOA fees include basic cable/internet access, irrigation water, land/lawn maintenance, club house maintenance and grounds. Carlton Lakes Homes: H.14220 - Impeccably maintained & beautifully appointed turnkey furnished pool home with serene preserve views. As you walk through the beautifully landscaped walkway you’ll soon be greeted by the custom glass front entry designed with a tropical motif. The spacious floor plan offers both living room and family room, 3 bedrooms, 2 bathrooms & a gracious lanai area w/plenty of room for dining & lounging poolside your salt water pool. The living areas have large tile specially treated & laid on the diagonal and the bedrooms have been updated w/wood flooring. The Master offers an in-suite bathroom w/dual sinks, custom framed mirrors & has been updated with a frameless shower, completely re-tiled and outfitted with a spa shower head & granite bench. Other notable features to this home include surround sound through the entire home & outdoor area, volume ceilings w/crown molding, 42”wood cabinets in the kitchen with both overhead and under-mount lighting,newer AC system w/double filter & light for the cleanest in air quality as well as having additional insulation added for energy efficiency. This home offers full hurricane protection including both electric & accordion shutters. Carlton Lakes Homes: Beautiful updated custom built 3 Bedroom + Den & 3 Bath home with southern exposure, preserve & long lake view with water feature & side car garage. Kitchen features stainless appliances (2014), quartz counters, tumbled marble backsplash & bay window with seating. Stove is electric & also plumbed for gas. The room off the kitchen currently used as dining room. Built-in gas fireplace is double-sided open to the dining & living area. The living area is spacious with beautiful view. The home is wired for audio in all rooms & has diagonal tile in living, kitchen, dining & hallways. The bedrooms & den have engineered wood flooring. The private master suite offers an updated master bath with beautiful wood cabinetry, extra storage, granite counters & a large walk-in master shower with separate tub. The guest bdrms share a full bath updated with granite counter. The Den, which can easily be converted to a 4th bedroom, has a built-in hutch and easy access to full bath with quartz counter. W/D new in 2018. The lanai with a beautiful updated pool and spa offers family enjoyment. Lanai and front door have electric hurricane shutters with roll down on remaining windows. Carlton Lakes Homes: Rarely Available, Only ONE on the market! Most Open and Spacious "Courtyard Design" home with separate Cabana, Guest House, that has been totally renovated with tile floors and separate bath/Shower only. Two Bedrooms +Den in main home includes Eat in Kitchen, Breakfast Bar, Living Room, Family Room and Formal Dining Room. Wood Floors throughout living area, 2 bedrooms are carpet.This home lives large for entertaining family and friends. TWO Screened Lanais; one West facing for fabulous daily sunset views and lake view; the other inside Courtyard is South facing overlooking lovely pool. Master Suite has 2 Closets, One is a Walk In. Master Bath has a Roman Tub, Walk In Shower and 2 Vanities. Bedroom #2 has a Walk In Closet. Utility Room has Laundry Tub and Walk in Closet. Kitchen has Walk In Pantry. Volume Ceilings. AC is NEW in 2017.Across the street is another lake view from the front of home. Home has been meticulously maintained by owner. Move in Ready! Close to The Beaches, Shopping, Restaurants, Downtown Naples, Ft. Myers International Airport and more! Come live the Florida lifestyle at Carlton Lakes! Home shows beautiful a MUST SEE! Carlton Lakes Homes: New to the market, this is a beautiful and well cared for home located in highly desired Carlton Lakes in North Naples. This community is conveniently located near shops, dining and the award winning beaches of SWFL. This home sits on a quiet cul-de-sac that has been beautifully landscaped featuring outdoor lighting for relaxing evenings by the pool. Front screened in entryway opens with French doors overlooking the large tiled living room through to the lanai and pool area. Floor plan offers great options with the 4th bedroom that also could make for a great den or office space. Spacious Master suite includes plantation shutters with sliders leading to pool lanai, large double vanity, large soaking tub & tiled shower with his & her closets. The pool and pavered deck was new in 2012. Carlton Lakes offers walking trails, clubhouse, club pool, fitness center, tennis, bocce courts, and a playground area. Carlton Lakes Homes: H.12927 - Gorgeous Lancaster Model Single family pool home featuring 3 bedroom plus a den, 2 full bathrooms and formal dining room with private preserve view. Special features include a brick paved driveway & walk way, screened front entry, volume ceilings, open concept floor plan with wood flooring in the living areas & master bedroom. Cork flooring in the kitchen area, Stainless Steel appliances, white cabinetry with crown molding and breakfast bar featuring granite counter tops make this kitchen a great spot for entertaining. Some other upgrades include: Plantation shutters on all the windows, soaking tub in the master bath, updated lighting fixtures, utility tub and overhead shelving in the laundry room. Enjoy the outdoors on your spacious covered lanai overlooking the pool with private preserve view. Amenities include a club house with pool & spa, tennis courts, bocce courts and a fitness room for residents. You are close to restaurants, shopping and beaches from this desirable North Naples location. Carlton Lakes Homes: Incredible value. Don’t miss out on this spacious and sought after Lancaster model - boasting 3 Bedrooms + Den (current use 4th Bedroom) + Formal Dining + Pool + Private Spa. 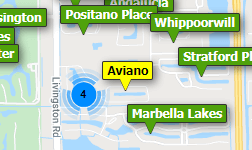 Carlton Lakes is an active community situated within 5 miles of Naples Famous White Sandy Beach. Amenities include 4 Tennis Courts, Bocce Ball Court, Basket Ball, Exercise Facilities and Resort Style Pool. The home offers many upgrades, including Granite Counters in the Kitchen, Crown Molding, Ceramic Tiles installed on the Diagonal and a Great Open Floor Plan for Entertaining. New Roof 2019*. Fantastic location. A-rated School District. Low Fees. Resort Style Amenities. Near Excellent Shopping, Restaurants, Airport & I-75. Contact us today to book your own private tour. This one won't last. Jasmine Point Carlton Lakes Homes: Immaculate 3/2 Home located in one of North Naples most desirable communities. This home boasts spacious bedrooms and plenty of space for a Condo living with a very open and enticing ambiance. There is a wonderful private lake view from the rear lanai that has southern exposure providing tons of natural light coming through the quadruple sliders leading from the family room. Carlton Lakes is a North Naples gated community that has a great amount of natural preserves and lakes through out the community, as well as lighted walking and jogging paths. The Clubhouse area has a lap pool and spa, bocce courts, tennis courts, basketball, tot lot and fishing pier. The community clubhouse also features a large meeting room and newer exercise equipment. Vanderbilt Beach, the Mercato, Publix at the Strand and downtown shopping areas and various dining venues are only a short drive away. This is a wonderful opportunity to purchase this Home and make it yours!